The descent through the steep sided valley as we made our way into China as a newly assembled convoy was a fine moment indeed. The sun had come out to play, the area was spectacular, and somehow even the infamous border guards seemed to be taking it easy on us for the day. The Chinese border is actually a 3 staged affair spread along 100km of the only road coming away from the border crossing. Our newly acquired guide was doing a sterling job of hassling whichever guard was trying to hold us up at any particular time, somehow managing to spare Ivor the indecency of the public strip search that he had suffered at previous borders. The only casualty to the brief customs inspection was a ripe honeydew melon – with which we would have no doubt caused endless damage to the Chinese empire. 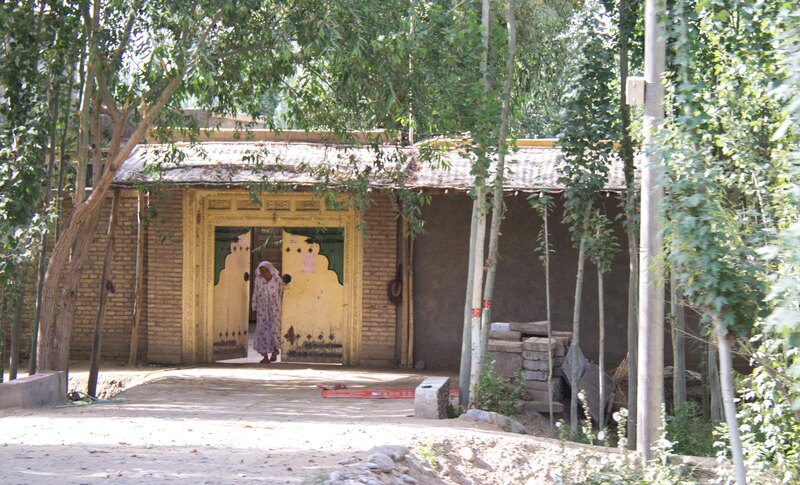 We rolled into Kashgar mid afternoon, immediately struck by a wall of heat and an immense increase in population. We carved our way through shoals of electric scooters and parked up in the hotel parking lot that would be home for the next couple of days, and went out for the first team meal. We were ripped off, by Chinese standards at least, and paid a whopping 10 USD for a meal out in a particularly fine restaurant. The food was amazing and super spicy, but we were soon to learn how cheap dining out in China really can be. Paperwork was the name of the game today. 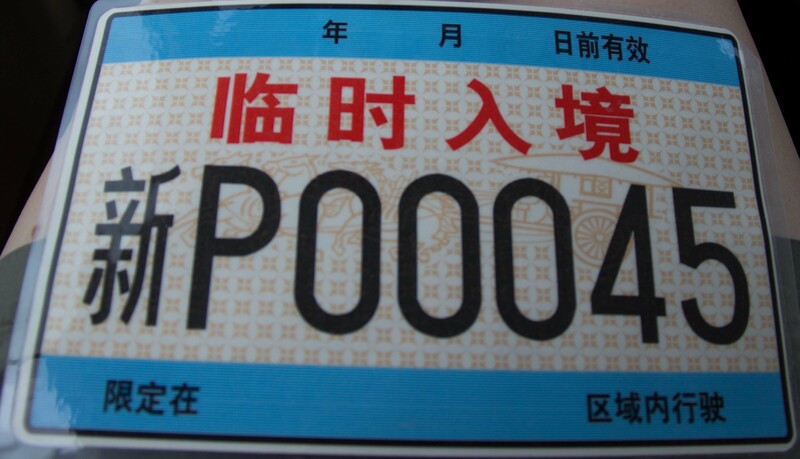 To enter China with a vehicle a foreigner must apply for a Chinese driving license, and have their vehicle temporarily re registered as Chinese – complete with temporary registration (license) plates. All of this had to be applied for 3 months in advance of our entry into the country. We had been provided with our licenses the day before, but today we had to take our vehicles for a brief inspection (brake test, headlights, and horn checked), before our lucky old guide had the privilege of completing the rest of the paperwork to finalise our entry to the country. Our free afternoon to explore Kashgar faded quickly into evening, into restaurant, and into bar. We headed off for an early night, while our guide was stuck dealing with the dreaded red tape til gone midnight. Another free day to explore the city – the bazaars and the street life felt the same as those of the Central Asian countries we had left behind. But on top of the Muslim culture that we had grown accustomed to, there was something undeniably different. In the parks there would be groups of people moving majestically, manoeuvring and positioning straight bladed swords with utmost precision; all following their master in perfect time. The architecture too was in many cases transforming into the multi tiered, ornamental slanting roofs that we associate with lands yet further east. The food too was changing – the shashlik barbeques on the street were ever-present, but the Chinese style restaurants that we are used to from back home were also creeping in. That day we went back to the standard of eating that we’d become more accustomed – street eats from the same places that you see the locals. We were pleased to find that we could eat quite well for a couple of dollars. 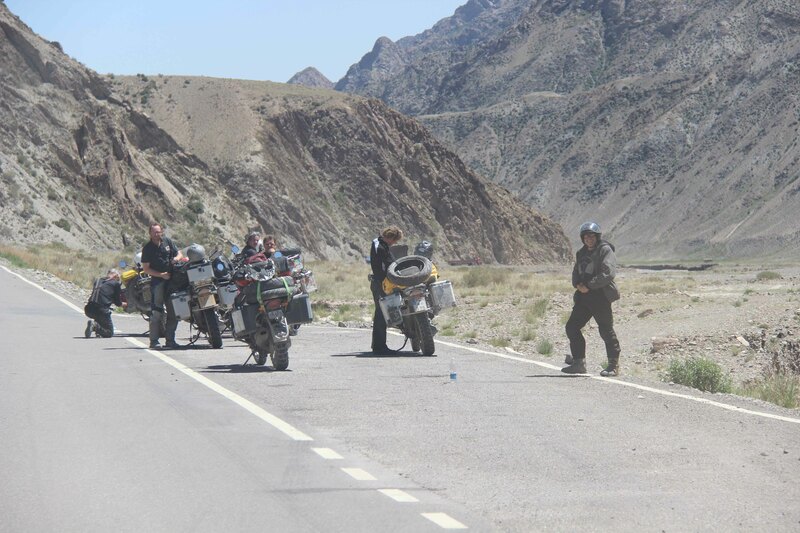 Enough of this messing about in Kashgar, we had a country to cross – and a heffing big one at that. We set off for Yecheng, and made good time, so decided to roll a couple of days into one on our itinerary so that we could build up a little margin for later on in the trip. The second stage of the day would take us along the southern edge of the Taklamaken dessert, and would be the first time that we had seen a sandstorm in full force. There was a savage side wind that was tearing clouds of sand across the road, and the visibility was reduced instantly to just a few tens of meters. To regrettably quote Chris Martin: “It was all yellow”. Sorry, we won’t make jokes like that again. We promise. Pinky swear. Anyhow, the wind continued for a good couple of hours, an even when we could see well enough we had to keep speed to a minimum – the cross wind was depriving Ivor’s engine of much needed cooling – so we had to sit in low gears and watch the temperature gauge intently. We arrived at the hotel at Khotan in the late afternoon, but since the Chinese have settled on having one timezone for their whole country, out west it was still going to be light for several hours. With Jon (who you may recall from previous postings is the fellow 4×4 driver, if you were paying attention that is), we got out the camp chairs and set about destroying some of the unnecessary stocks of vodka that the bikers had loaded into our trucks back in Kyrgyzstan. The car park party was on – much to the delight of the hotel restaurant staff that were all crowded around the third floor windows watching what these strange white folk were up to. A little too much of the Russian medicine was sitting in our empty stomachs, so some acting and a ‘point-it’ book were put to good use in an attempt to get our onlookers to hustle us some dinner out of the kitchens. A car pulled up not long later – out came one of the restaurant staff, complete with take away noodles for all three of us. He wouldn’t take any money for them, but had obviously just been out especially to fetch us some dinner. The same guy would go yet further in securing his ‘trip legend’ status by driving us all around town taking us to the local night club, and putting up with our enthusiastic partying until the wee hours and delivering us back to our trucks afterwards. To be honest we had all overcooked it a little the night before, so day 61 was getting off to a sluggish start. The biker gang had earnestly gotten themselves up at a reasonable hour and headed into town to see the jade market and other such tourist attractions. The truck drivers were only fit to move sometime in the mid-afternoon – but it sounds like we had the better time of it in the long run, and certainly we had better tales to tell. We had neatly avoided the worst heat of the day by sleeping through it, and took a stroll about town in the early evening. After searching out some street eats we carried on through the main square where there was a large dance going on. We stumbled over each other’s feet for a short tour of the square and quickly shrunk away feeling a little embarrassed by our poor effort. Kim’s hand was soon taken by an older Chinese lady, who made a much better job of leading her round for the rest of the song. It was not long before the music stopped, and the arrival of riot police troops clearly signified that the party was over. Some would argue that the approach was a little heavy handed for breaking up a formal waltz, but hey, that’s the fun lovin’ authorities for you. A morning spent trying to stop those damn brakes from squealing again, and then a slow departure from Khotan spending yet more time trying to find a petrol station that would serve bikes (it is illegal to do so, for fear that pyromaniac motorcyclists will be off to torch the nearest police station, yes it has happened in the recent past), and then finding a route out of town that could accommodate Ivor’s lofty height, we had managed to set out from town in the hottest part of the day. The bikers, in all their protective gear were not impressed – and actually it was not that fun for us either. The UK military had somehow overlooked the air-con option when they’d specified Ivor’s build, instead preferring to mount the hot engine close to the occupants of the cab, with only thin sheets of metal and fiberglass to separate them. We stopped briefly at an ancient Buddhist temple, which dated back to the 500’s – but despite the impressive artwork that was still intact we all left a little uninspired. On reflection, this is probably just because most of us were melting. Tonight was supposed to be a camping night for the whole group, but since the bikers were all frazzled the guide allowed them to stay in a hotel, while us 4x4ers went off with him to find a camping spot just out of town. We veered off the road and found a nice patch near a lake, with only a few hundred goats, half a dozen cows, and a few donkeys for company. Sorry, we’ve been so rude: Nearly a week in China so far, without so much as an introduction to our guide. Ladies and Gentlemen, allow us to introduce Mr Lun Wang. Also to be known as ‘The Lunster’, ‘Lun’, or ‘Lun-atic’, as our mood towards him at the time will dictate, he is a kind hearted man, just turned 60, who has been guiding for a good many years. He does have certain organizational issues, which will come up later in this blog for sure. 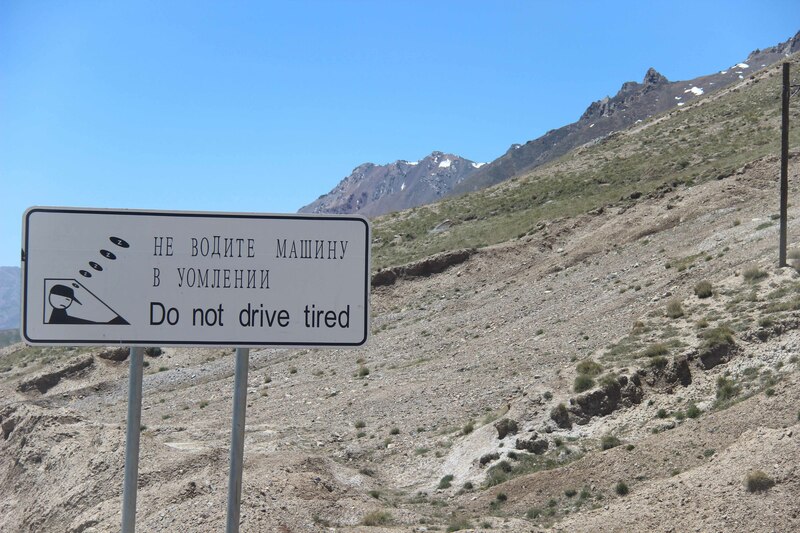 And all too often the directions he gives are in the past tense; “It was back there”, “the hotel was here 2 years ago”, are all well and good until it’s rush hour in Khotan, and you’re trying to do a U-turn on a 6 lane road in a six and a half meter truck, with a caravan of motorbikes , in traffic that makes the north circular (/ the Q.E.W. for our Torontonians) look like a country lane (outside of harvest time). He owns a GPS, but leaves it at home, since he thinks he’s too old to be able to work it. All that aside, he’s a good man with a razor sharp sense of humour that makes the trip more fun in the long run; he’s one of the good guys. So we awoke from our first proper night of ‘wild camping’ in China and went back to the hotel to collect our two wheeled amigos. 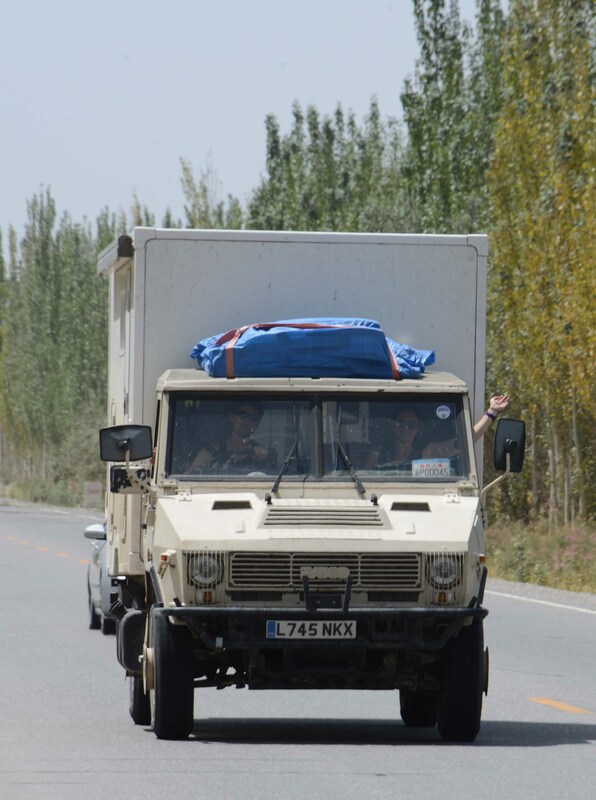 On route we spotted a military truck that was exactly the same as Ivor (bar the caravan rear end). Kim whipped out the camera, but in fumbling with the switches, dials, and focusing failed to get the shot. We were lucky – within seconds the police sirens were wailing as one car pulled up behind us, and we were treated to another view of that Iveco as it swung into our path to prevent us from making a run for it. The gun-bearing soldiers got out and made short work of checking our photography equipment – fortunately finding no shots of themselves on the SD card, our precious Canon SLR was returned to us. They really do take this kind of thing very seriously. Not the brightest lot though. Jon was just behind us, and with the cameras mounted on his truck filmed the whole thing! 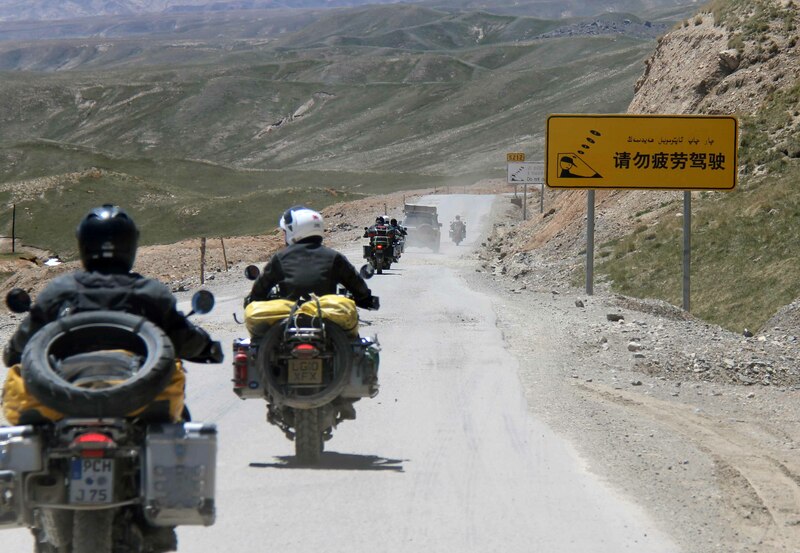 Once we’d re-acquired the bikers we set off for our first full day crossing the Taklamakan dessert – we would be headed straight north for the next 700km. 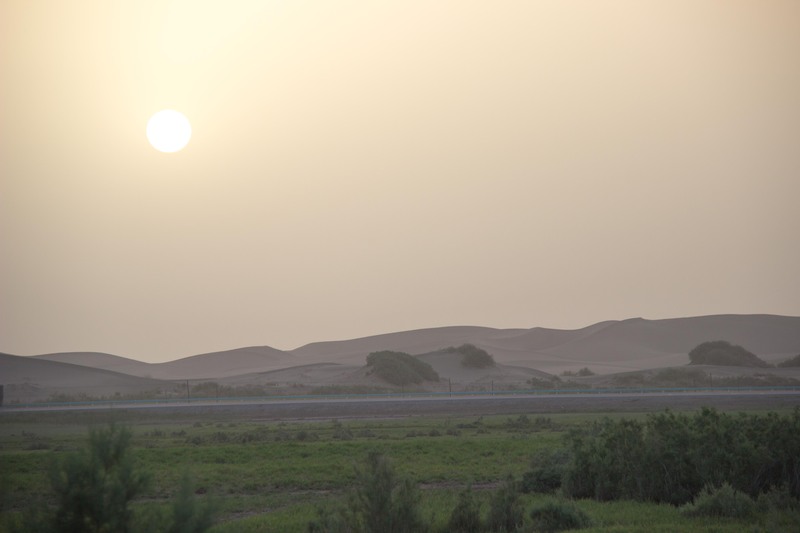 This expanse of sand dunes used to be viewed as one of the toughest obstacles along the silk roads. It’s name even means ‘you may enter, but never leave’. It was feared not only for the intolerable heat and the shear distances between oases, but for the bandits that roamed its periphery, waiting to relieve any trade parties of their wares. 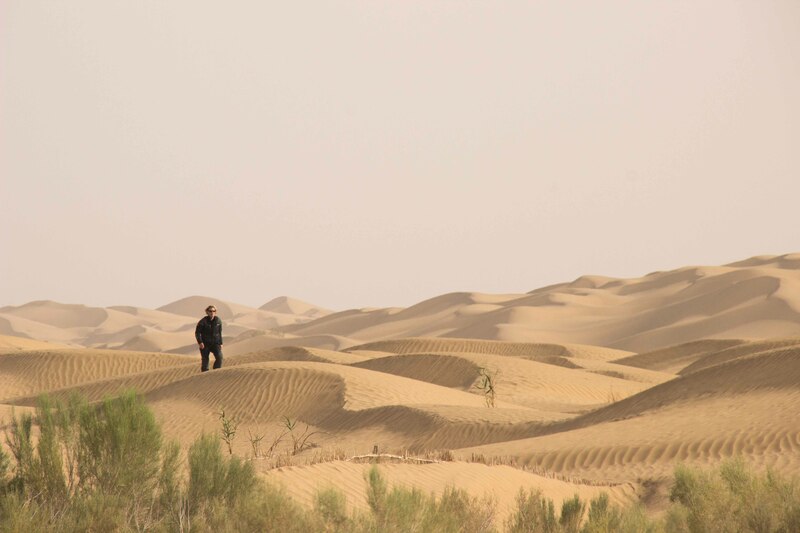 Fortunately for us the Chinese have recently discovered black gold beneath it, so went to the effort of heating the shifting sands to the point where they melted deep enough to form the foundations of the paved road that today cuts the dessert in two. Even the bandits of old have been replaced with meagre traffic cops that, in our case, can be seen off with a bark or two from the Lunster. The scorching power of the sun still remains though, and it was pushing over 40 degrees C by mid morning. We made as much distance as we could, making 500km past the featureless dunes. 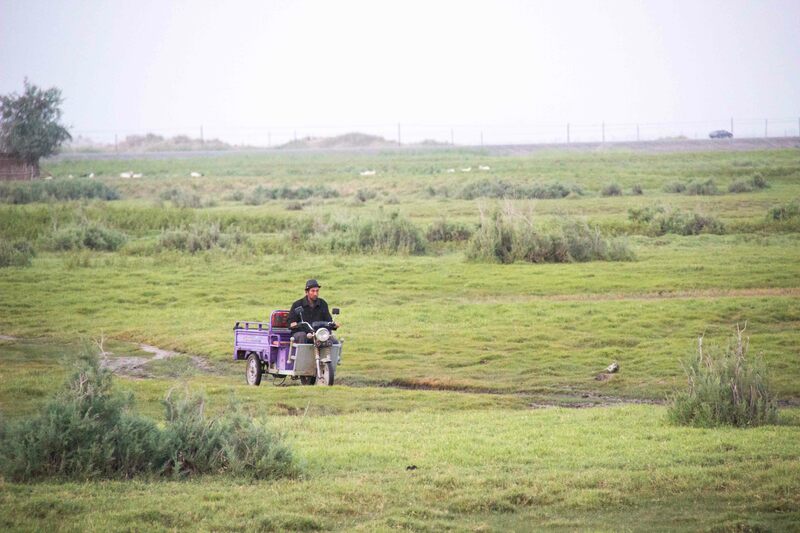 By the time we set up camp, vegetation had steadily started to reappear at the roadside and we had made it to the Tarim River at Lunnanzhen – one of the only water sources of the whole dessert. The bikers stayed at the truck stop town at the mid-point, not yet ready to swap the luxury of hotels for canvas. We cooked up some rice and spicy veg, which we persuaded Lun to try – he went for a walk, and came back with a suspiciously clean plate, patting his belly and saying “yum yum”. Naughty Lun! No dinner for him next time. One week in to our trip through the country, and it was shaping up to be an interesting section of our voyage already. 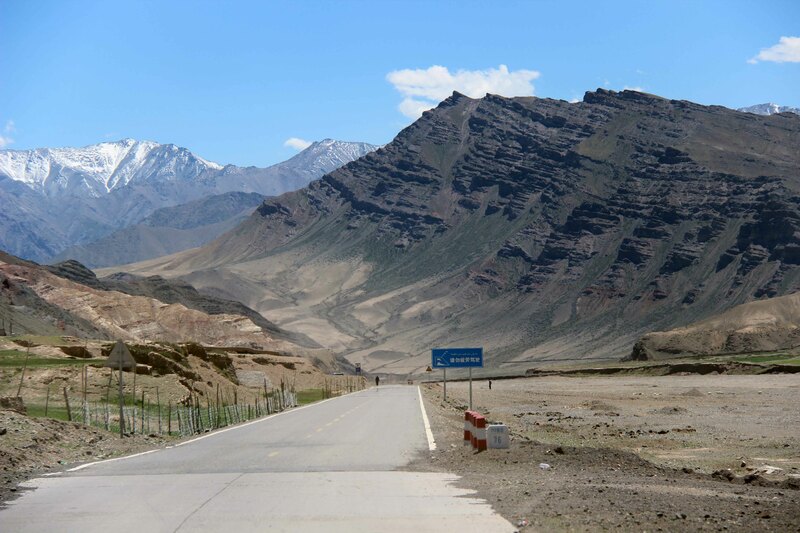 It had been in stark contrast to the serenity that had emanated from the Kyrgyz highlands only seven days earlier, yet we still did not feel that we had entered the heart of China. The Xinjiang cities that we had visited so far seemed to be more a mix of the Central Asian cultures, with just flavours from a culture based further east. We were keen to push on – to see the variations in the lands we would pass through, and put the toughest of the dessert crossings behind us. Another brilliant account! Thank you.